You can tell a lot about an organization by the one-off, one-time ads they create. These are used for many purposes - professional announcements for new hires or offices. Or when they want to share some self-congratulatory news or award the media won’t write about. A popular variation of this is congratulating a high-profile client who’s received an award. 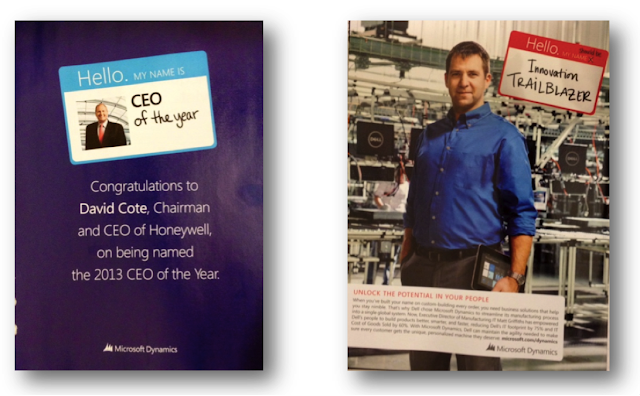 The July issue of Chief Executive magazine shows a range of ads from companies who want to publicly congratulate Honeywell’s CEO David Cote for his selection as the publication’s CEO of the Year. (If you're a personal friend, you call or send a note. If you want to show everyone that your company knows the honored person, then you take out an ad...). JPMorgan Chase followed the “Meaningless Clip Art” style favored by low-level designers without strategic advertising expertise. The generic, ambiguous headline offers no real information to the reader and isn't intriguing enough to cause people to read the body copy below it. Further, the clip-art graphic isn’t unique or interesting enough to cause anyone to want to learn what the “reason to celebrate” is. The text is the obsequious kiss-up language interns and low-level marketers think they’re supposed to use. Be careful when flattering influential people, it’s easy to look weak and sycophantic. Cheap artwork, safe text, and the typical layout that’s easy to produce by low-level in-house designers. They wasted extra money buying the inside cover, although they’d have been better off using it to hire a professional copywriter or ad agency. Score 4.0/10. New Jersey’s cluttered ad is the “Designed by Marketing Committee” variation. A confusing headline (“States aren’t innovators?” Huh?). Too many conflicting design elements with too many things to look at, in no particular order. Your eyes don’t know where to go or in what order; they just bounce around the page struggling for a focal point. It features the two telltale signs of an inexperienced committee: (1) small-type alphabetical lists of information no one will ever read, and (2) no white space to give your eyes a break. The point of the ad, the actual “Congratulations!” is stuck down near the bottom, but since they spent the money on an ad, they might as well also list their entire 17-member Board of Directors, and every one of their 19 “Partners,” whatever that means. These types of ads are what happens when “Susie knows how to use the design software” but doesn’t have professional-level design experience. This looks exactly like most government-sponsored ads. Score 3.0/10. RHR International’s ad is a good example of the “We don’t have a brand” variation that is assuredly developed in-house. No style or elegance, it looks cheap, like it was created in Word or PowerPoint. However, it effectively conveys the necessary information without slavering or slobbering all over Mr. Cote. There’s a little “what we do” language in the brown bar, but not so much that it becomes an ad about themselves rather than the honoree. Ugly and boring, but not overwhelmingly negative. Score 5.0/10. Microsoft Dynamic’s ad is the “Connect it to our Campaign” style. 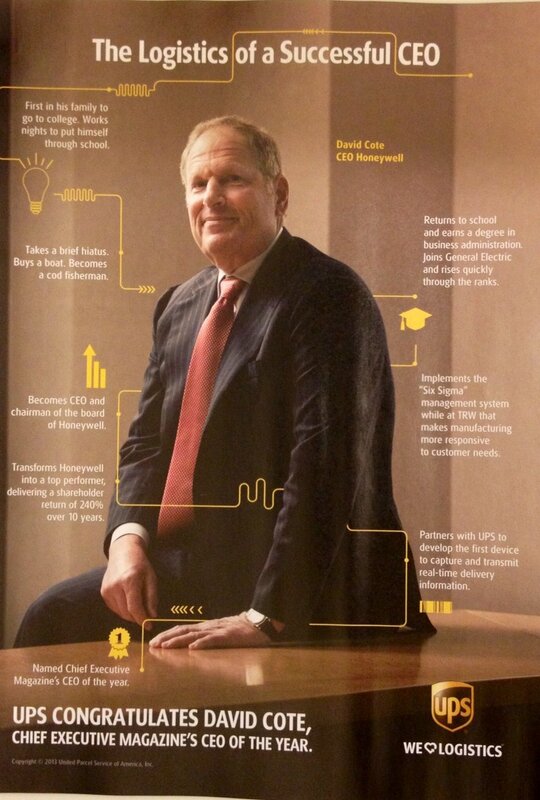 I initially thought it was simply a slightly more creative version of the RHR ad, with a straightforward headline, and graphic that uses his headshot in a relatively unique way. On the back cover you later see MD’s other ad, and learn that the “Hello, My Name is” design is actually part of MD’s larger ad campaign. The clear winner was UPS, with its “Creative, Professional, and Effective” ad. It leverages UPS’s well known brown color and national “Logistics” marketing campaign. They didn’t simply use the PR Department headshot, but rather shot a warmer, and more compelling, full-page photo. Their orange lines and icons remind us that it’s UPS, but they’re used like a timeline to inform the reader about Cote’s interesting resume and personal story. They use their brand to tell his story, but in a fun and effective way. It’s a full-page UPS ad, but it doesn’t fall into the sycophant trap or look like they’re insecurely or disingenuously trading on his reputation to prop up their own. This shows high-level design and creative work by a skilled, professional agency. A home run. Score: 10/10. All images are copyrighted 2013 by their respective companies. Following your comment about marketing language, what kind of text makes you look weak when trying to flatter influential people? That's an interesting and complicated question, Logan. There are many variables at play. Context is obviously important, as is how obsequious the language. What is your relationship with the influential person? How does your stature compare to theirs? Where is the conversation occurring? Who else is present? What's the communication medium? I believe that saying something nice about someone perceived as a peer or junior to you is generally viewed as nice and considerate, whereas complimenting your boss can be tricky. Obviously, context is also important -- is it in a magazine advertisement or in a private office? Could I be perceived as trying to get something from this person? That is, saying something complimentary about the President of the US won't make me look like a "climber," because I don't know him and it's not likely to lead to me getting a promotion or new business. This gives the comment more integrity. Gushing about my direct boss or superior in front of her would lead to eye rolling, unless it's in an environment where that would be expected, e.g. introducing her at a conference. I'd think it's pretty nuanced. What do you think?